A constellation of smallsats that will occupy Low Earth Orbit (LEO) and that will generate reports on wireless signals that can be used to track and monitor global transportation networks, assist with emergencies as well as other data analytics is being developed by HawkEye 360. 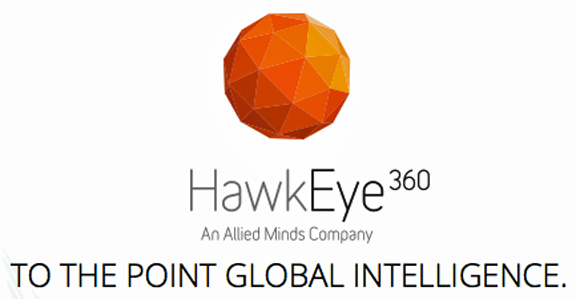 A subsidiary of Allied Minds (LSE: ALM), Hawkeye 360 is the company developing the constellation and they are now collaborating with Lockheed Martin (NYSE: LMT) to apply the firm's radio frequency (RF) detection and mapping technology into new markets. HawkEye 360 plans to deploy a constellation of smallsat in LEO at less than 600 km (383 miles) from the Earth’s surface, to identify, locate and analyze global RF signals. Pending various regulatory approvals of this system and capabilities, Lockheed Martin and HawkEye 360 will work to apply the space-based RF data and analytics capabilities in new mission solutions, potentially extending the adoption of this technology across multiple customer segments and new markets. HawkEye 360’s envisioned constellation, once operational, could enable significant commercial applications such as allowing government and corporate customers to dynamically monitor transportation networks across air, land and sea. For government regulators, telecommunications companies and satellite broadcasters, HawkEye 360’s system is being designed to monitor RF spectrum usage to identify areas of interference. The envisioned system could also be used to play a crucial role in the detection and location of activated emergency beacons, improving response times that are critical in life-threatening situations. HawkEye 360’s technology complements Lockheed Martin’s expertise in this field. Over the past 50 years, Lockheed Martin has built more than 800 satellites and 310 payloads and the firm's experience is extended through the RF Payload Center of Excellence, which collocates RF development, assembly and test for a variety of spacecraft types, from cubesats to human spaceflight. Chris Silva, Allied Minds CEO, indicated that their relationships across multiple customer domains will be invaluable to help accelerate the commercial use of HawkEye 360’s RF monitoring data and analytics. According to Dave Markham, Vice President of Strategy for Lockheed Martin Space Systems, the combination of Lockheed Martin’s expertise in satellite systems with HawkEye 360’s approach to space-based radio frequency detection offers an innovative solution to some of the biggest challenges that face our shared customer base. As with any event, one of the major draws in regard to the time commitment necessary for attendance will most assuredly revolve around the expertise that will be offered to those who participate... there can be little question that the subject matter experts who will be presenting at the SmallSat Symposium—Silicon Valley in 2017 will blend their expertise with the unparalleled networking opportunities with one's smallsat, SATCOM and MILSATCOM peers. Event information and registration available at this link. The Computer History Museum in Mountain View, California. This incomparable event will be held at the Computer History Museum in Mountain View, California, a perfect location for the technology-rich environs of the smallsat worlds. Listed below are the sessions already planned for the SmallSat Symposium. For information regarding the various workshops, please select this direct link. 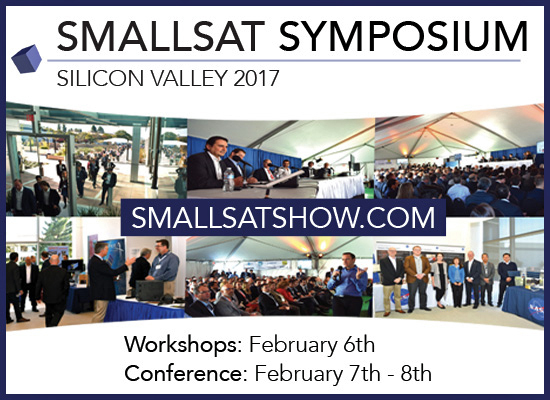 To learn more about the individual speakers who have already committed to the SmallSat Symposium—Silicon Valley 2016, access this direct link. Today's small satellite industry demands sound business and financial practices. How do we best cultivate dependable practices? Panelists explore the various types of small satellites (Nano, Pico, Cube, Etc. ), their leading applications, as well as trending uses in each subset. How do we define the small satellite marketplace and what is its size? How much new growth can come from small satellites and which segments and markets represent the greatest opportunities? What “traditional” types of capacity and services are changed by the growth in small satellites? Importantly, how do small satellites affect the satellite market as a whole? Investment in small satellite ventures originates from a variety of avenues including angel investors, venture funds, private equity firms, corporations, commercial banks and public markets. How do the varying demands of each of these financiers affect small satellite operations and planning? What are their expected returns and financing terms? What are the most important criteria investors look for in choosing ventures to fund? How much of a role does private equity activity and debt financing play in funding SmallSat operations and what effect does this have on management behavior? Panelists will discuss how different types of investors perceive the small satellite industry. Launching any satellite is inherently a risky and expensive business. Multiple new launch options are being created that offer opportunity to minimize risk and reduce costs. Executives from commercial launch service providers will share their views on current market trends and on their strategies to deliver the most adapted solutions for the launch of small satellites. How will new innovations, launch availability, changes in satellite designs and durability in small satellite design alter the future of the launch sector? What is the impact of re-usable engines on future launch costs? Which propellants, engines, components and new technologies are the launch sector investing in? What are the game changers? Panelists will discuss strategies for funding launch operations and the time it takes to book a flight. As hundreds of new small satellites are launched ground systems must keep pace to track and communicate with them. What will be the increasing demands for these systems, as well as new autonomous onboard TT&C developments mean for the ground system market? What are the most important criteria in selecting ground system architecture for small satellites? What current and recent trends might change market dynamics in the future? Disruptive innovations create new markets. Business development executives will present their views on market opportunities and where to sell the multitude of products that have resulted from the SmallSat revolution? The collision of finance and technology has produced both turbulent markets and spectacular innovations. Who has bought, who will buy, and what will they pay? More importantly, how should products be priced to maximize revenue? How do small satellite alternatives compare to older technologies? Panelists will discuss foremost applications where cost savings are changing paradigms. The focus will be on different development models, prototypes and early operations including the overall positioning, level of vertical integration and cooperation with other industry stakeholders. Also under discussion will be budgetary considerations unique to the small satellite platform. Speaker: Craig Clark, Founder, Clyde Space Ltd. Professor Sir Martin Sweeting, Founder and Executive Chairman, Surrey Satellite Technology Ltd.
Sir Martin has a BSc in electronics and PhD in radio engineering from the University of Surrey (UK) and is the founder and Executive Chairman of Surrey Satellite Technology Ltd. (SSTL). Following two experimental ‘microsatellites’ built by his research team at the University of Surrey and launched in 1981 & 1984, he pioneered rapid-response, low-cost and highly-capable small satellites utilising modern consumer electronics to ‘change the economics of space’ and has established the UK at the forefront of this new field. As small satellites spread across the skies, questions about constellation management arise. What is involved in designing, implementing and maintaining multiple satellites in a small satellite constellation? How does operating a small satellite constellation differ for a more traditional satellite system? What are the most important applications flying in constellations today and what might they be tomorrow? Speaker: Jenny Barna, Launch Manager, Spire Global, Inc.
With over 400 Earth observation satellites (50kg+) planned for launch by 2025, and an additional 1000 satellites below 50k flying in constellations, the coming decade of growth in observation satellites is enormous. From agriculture & mining to traffic observation, mapping & weather, small satellites provide an opportunity to observe our planet in considerable detail. High resolution, accurate data provides a range of solutions to meet the immediate needs of emergency responders, defense users and location-based services. In how many ways can Geospatial Data be presented and be useful? Who are the important customers and what are their primary concerns and requirements? Speaker: Dr. Alex Saltman, Senior Vice President, GeoOptics Inc.
What is the optimal way to secure capital for the startup phase of a SmallSat venture? What are the different dynamics of getting funding for a startup SmallSat operator vs a startup manufacturer/launch service provider or data processing company? Explored in this panel are the various ways capital suppliers view revolutionary ideas. Has the complexity of the financial market led to roadblocks for SmallSat operators and manufacturers? How do operators avoid financial pitfalls (funding gaps, etc.)? Beyond the first funding round, how will investors approach adding capital to a maturing venture? What is the past and present performance of the sector and what are the current and expected trends for industry consolidation and M&A transactions? Traditional Large Integrators—What is their Role in the SmallSat Industry? Threat or opportunity? What are the majors doing independently or with their affiliates to capitalize on the SmallSat market? Airbus, Boeing, General Dynamics, Hughes, Lockheed Martin, Northrop Grumman, Raytheon, SSL and Thales Alenia are known for the scale of the systems they implement. How does each approach the small satellite market, and how does the scale of their organizations affect that approach? What new technologies will fly in the next generation of small satellites? What terrestrial equipment will be necessary to support these innovations? Speakers will discuss potential new applications, private sector technologies, space tech incubators, notable advances in design and implementation, advanced materials, 3D printing and robotics. What will be the role of NASA, NOAA, and Research Universities? What new business models and applications might be enabled by the birth of new technologies? Defense, Government and NGO sectors require both remote sensing intelligence to detect and classify objects and also connectivity for secure, mission-critical communications. With advancements in small satellite technology, what kinds of improvements could SmallSat bring to existing solutions? What kinds of innovative new solutions might materialize? How do SmallSat operators work with government partners?